(U//LES) This report serves to present information and analysis associated with fire, arson, and bombing incidents at houses of worship (HOWs) occurring within the United States for the past 5 years, between January 2011 through December 2015, and reported to the Bureau of Alcohol, Tobacco, Firearms and Explosives (ATF). In total, there were 733 fire and explosion related incidents, per ATF reporting, for all 50 States. The information contained herein does not represent all fire, arson and bombing incidents for the United States. This report only represents those incidents that have been reported to and investigated by ATF. 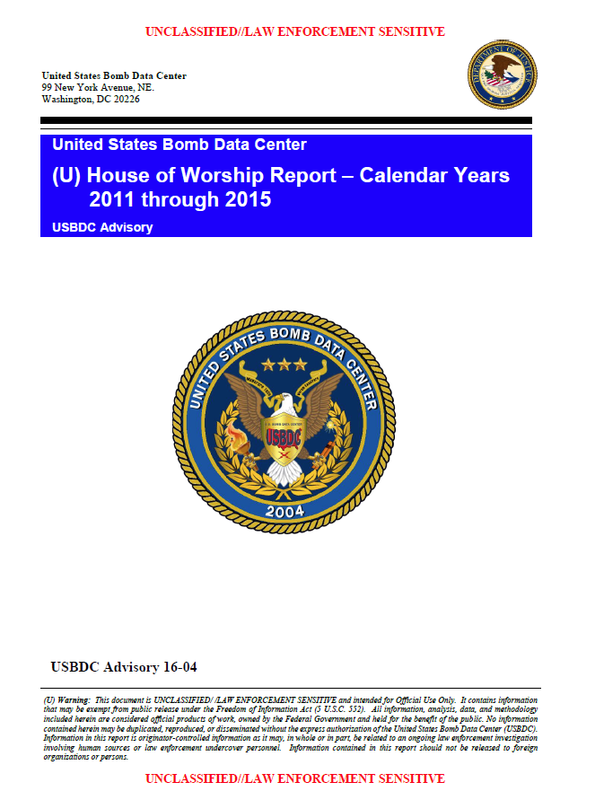 (U//LES) A total of 733 house-of-worship incidents were reported and investigated by ATF. (U//LES) There is no evidence of a nationwide racial conspiracy associated with houses of worship. (U//LES) There were 172 incidents reported for calendar year (CY) 2015, a significant increase compared to the prior 4 years; from CYs 2011 through 2014, the number of incidents ranged between 127 and 147. (U//LES) Incendiary fires have slightly increased since calendar year 2011. (U//LES) The number of incidents reported within a month averaged between 12 and 14, with January and July being the highest for the year. (U//LES) Of the reported cases, 496 were closed (147 for accidentals fires, 166 for incendiary fires, and 172 for undetermined fires). In addition, 99 cases identified a person of interest or an arrest. (U) On July 3, 1996, the Church Arson Prevention Act was enacted into Federal law, and the National Church Arson Task Force (NCATF) was formed at the direction of President Bill Clinton to address concerns over the possibility of a nationwide racially-based motive associated with fire and explosives incidents at houses of worship. ATF was designated to investigate the origin and cause of all fire and explosives incidents at houses of worship. ATF continues to respond to house of worship (HOW) fire and explosives incidents and serve as a repository for data pertaining to all of these incidents. (U//LES) For the past 5 years, ATF reported 733 fire and explosion related incidents associated with houses of worship. Of those incidents, 156 were determined to be accidental, 15 were bombings, 316 were incendiary fires, and 233 were undetermined fires; “other” incidents totaled 13, for (attempted arson, threats, and recovery of an incendiary device).34 In addition, ATF reported 16 persons injured and 6 persons killed within the past 5 years. (U//LES) Figure 1 illustrates all categories of HOW incidents for the past 5 years. All incidents appear to be on average with the exception of incendiary and undetermined fires. Both of these incident types tend to have similar numbers each year; however, the numbers have increased within CY 2015.